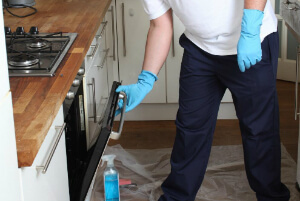 Oven Cleaners Wandsworth SW - Residential & Commercial Kitchen | Quality Property Care Ltd.
Quality Property Care Ltd. is a professional oven cleaning company, that provides commercial and domestic oven cleaning. We deep scrub ovens of all kinds for residents, expert kitchens and businesses in Wandsworth SW and the area. The oven cleaning service involves the disassembly, cleaning, soaking and scrubbing of every part and then reassembly of the oven. The service is provided by insured, trained and certified oven cleaners at a great oven cleaning price. Together with the deep oven cleaning, you can book fridge and freezer cleaning, cleaning of hobs, microwaves, warming drawers, grill and BBQ, as well as an overall commercial and domestic kitchen cleaning. Cook healthier food and save energy after the safe and green deep oven cleaning service. No matter what type of oven or cooker you have, contact us online or by phone right away, and get a free estimate for the service you need. The cleaning is performed with pet and children safe, green detergents. Our detergents have antibacterial qualities, keeping your kitchen fungal-free. We use special detergent for fridges with a lasting effect but with no harmful consequences for your health or the food. We take apart any moving parts and clean them one by one, removing any leftover food from them. The main body of the fridge is thoroughly cleaned, removing any food, streaks and pieces of fruit from the racks. To remove unpleasant odours we use an odour neutralizing agent. All of the appliances are treated with the right detergents, which are eco-friendly and guarantee the safety of you and your family. Once everything has been cleaned we reassemble the parts and leave them to dry. The top of the stove is polished with a professional finish for the glass of the oven door to stop mild scratching. You examine the completed job and decide if it’s up to your requirements. If you are not satisfied with it, the cleaners will attend to the areas which cause the problem and clean them again for free. 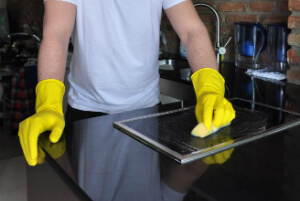 We also deliver full kitchen cleaning including light switches, all surfaces, inside and outside of appliances with deep cleaning of cupboards, fridges, sinks, freezers, hard floor. To properly clean your oven, regardless of the brand, we use a dip tank method to degrease all removable oven parts. First we take apart anything we can, trays and extractors are taken out and dipped into a special mixture of water and a degreasing detergent. That way they are completely stripped from the most stubborn grease patches. Extractor filters, trays, light protectors, panels and control knobs are all removed and dipped in the tank to soak. When all parts are removed we start removing the burnt food leftovers. If left there this may damage the filters and fans of the oven as well as affect the quality and taste of the food. To start degreasing the oven we use a special degreasing detergent that removes the bind of the fat molecules bound to the surface of the oven panels. It is harmless and leaves no trace once wiped clean. We scrape any residual grease from the oven and the removed parts, all dirt and stains are removed with a special spatula which cuts close to the base. Choose Quality Property Care Ltd. Oven Cleaning and Get Special Price! Contact us at any time! Dial 020 3746 4287 and talk with our customer support team. You can use the booking form located on the website to get answers and book. If you want more information on pricing, the services or to get a free estimate, use the hotline number. We regularly have new deals and offers for our clients, so stay in touch with us to save time and money on your next order.